Alfa Romeo was building cars when the League of Nations was born. It has a long history of fielding handsome sporting machines. So it wasn't too eyebrow-arching when its first SUV — the 2018 Stelvio — turned out to be a particularly lovely, high-performing compact crossover. What I found more puzzling was the name. What, pray tell, is a Stelvio? So I assigned a team of distinguished etymologists (consisting of me) to find out. The research showed the term is used to identify a number of places, persons, and things, most of them Italian. Stelvio is the name of a town and a cheese. There are also Italy's Stelvio Pass, Stelvio National Park, and Stelvio Piste, a downhill skiing facility named after the pass. And let's not forget Italy's ever-popular composer Stelvio Cipriani, film director Stelvio Massi, and musicologist Stelvio Mestrovich. Not all the Stelvios are Italian. There's Stelvio, a suburb of Newport, Wales, and Stélvio Rosa da Cruz, a Portuguese footballer. So, which of these is the car's namesake? I was fairly certain it wasn't named for a provincial cheese or a Portuguese athlete. But what? I asked Lisa Barrow, a Fiat Chrysler spokeswoman. She said it was named after the Stelvio Pass. It must be a pretty, fun-to-drive mountain pass, because the Stelvio test car was certainly that. Alfa may have been late to the SUV buffet, but it is certainly making up for its tardiness. For my money, it's the most gorgeous crossover entree on the table. And with a starting tag of $41,995, and a 0-to-60 time of 5.5 seconds, this all-wheel-driver has to be the quickest luxury crossover at this price. The Stelvio is beautifully styled and so distinctive in a sea teeming with anonymous competitors. I love the front end of this car, with its signature V-shaped grille containing the Alfa badge with its green dragon and red cross. The tester's optional 20-inch alloy wheels added to the eye candy. The interior is also a source of pleasing aesthetics. The design is clean, flowing, and understated. The black leather seats proved as comfortable and supportive as they were handsome. 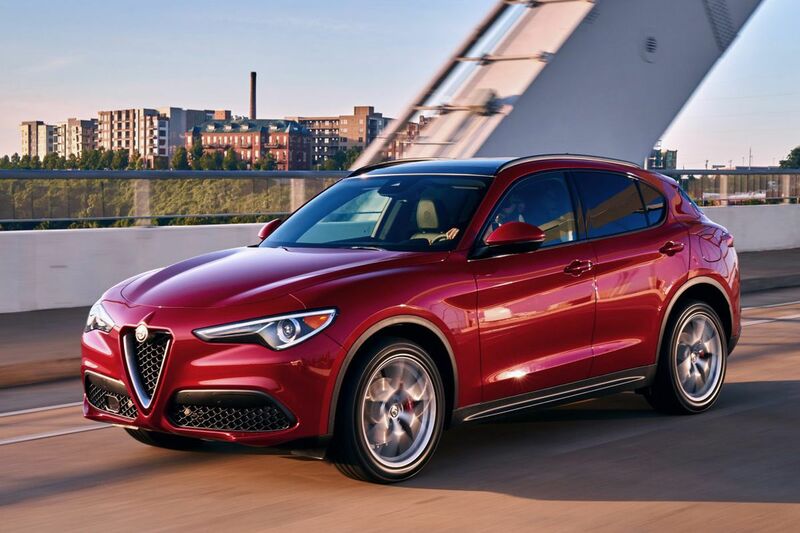 The Stelvio's quickness derives from a two-liter four fitted with a twin-scroll turbocharger and direct injection. It develops 280 horsepower and a hefty 306 pounds/feet of torque. This is the same engine employed in the Alfa Romeo Giulia sedan and is identical, architecturally, to the 2-liter turbo in the reworked Jeep Cherokee. In the Stelvio, this engine teams with ZF's slick, eight-speed automatic gearbox to send its glad tidings to all four wheels. I enjoyed putting the Stelvio in "dynamic" driving mode, jumping on it from a standing start, and letting the good times roll. Taking this car through the twisties at an aggressive pace shows just how much Alfa has blurred the lines between a crossover and a sport sedan. But then, you can argue that the Stelvio is, in essence, a jacked-up Giulia sedan. The Stelvio takes the corners with a ballerina's body control. The steering's precision is another confidence builder. An interesting aspect of driving this car is that it feels like more than the sum of its performance statistics, which aren't shabby. Another noteworthy component is the compromise the engineers were able to negotiate between handling and ride comfort. The undercarriage is firm enough to serve the car well in athletic contexts yet doesn't beat you up on rough pavement. Certainly, those suspension designers have made a pact with the devil. Standard equipment: Two-liter turbo, eight-speed automatic transmission, all-wheel-drive, Brembo performance brakes (four-caliper in front), all the usual safety and hedonism suspects, and more unusual touches like gloss red brake calipers with white Alfa Romeo script. Options: A cornucopia filled with stuff like premium sound, a dual-pane sunroof, and nifty, 20-inch alloy wheels.